oeIt was one of those days when you just feel inspired to draw something, but you don’t know what and then your eye rests upon something that sparks your creativity. I was just returning from a shopping trip in Newcastle upon Tyne, when I spied some Highland cattle from the lofty heights of the double-decker bus I was travelling on. The colour of the cattle, a rusty orange, captured my imagination and I sourced some images online on my return home. 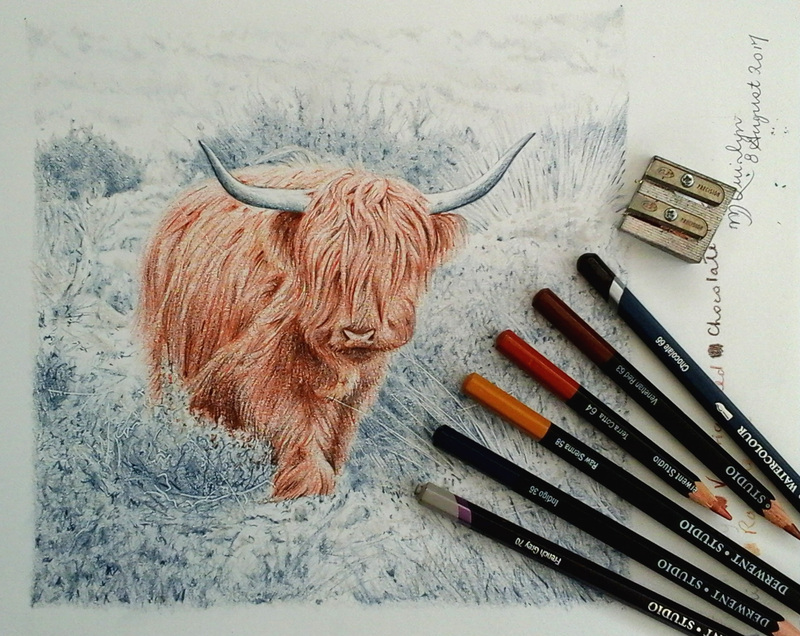 I found an excellent picture of a Highland cow and decided to reproduce it using a limited colour palette of coloured pencils: French Grey, Indigo, Raw Sienna, Chocolate, Venetian Red and Terra Cotta. I didn’t allow myself to use Black pencils. As well as working with a limited palette, I only allowed myself three-hours to create the drawing and the colouring. In hindsight it could have done with some extra work, but I was determined not to go over the time allocation I had set myself from the outset. In many ways this colour and time exercise reminded me of when I was a student at Cumbria Institute of the Arts in Carlisle. A friend and former colleague, Graeme Stobbart, asked me if I could produce a portrait of his two dogs, both of which were no longer with us. Unfortunately, Sam, the Jack Russell, had been passed for a good number of years and the photographs that Graeme and his family had of him were of a quality not best for producing a detailed illustration. However, after sourcing and selecting a number of photographs of Sam, from different angles, I was just able to work out his facial marking and colouration. It wasn’t the easiest of jobs I’ve ever had to do, but sometimes it’s worthwhile making the effort for a friend, especially one that would go the extra mile for you. I was pleased to get this commission completed when I did, and was delighted to hear that Graeme’s parents, Derek and Diane, were delighted with the finished illustration. It made all of the effort spent at the drawing-board worthwhile. The hardest part for me was putting pencil to paper, not knowing whether the finished result was going to be what myself or my clients expected. This illustration was also a first for me, as I have (very surprisingly) never drawn a West Highland Terrier before. 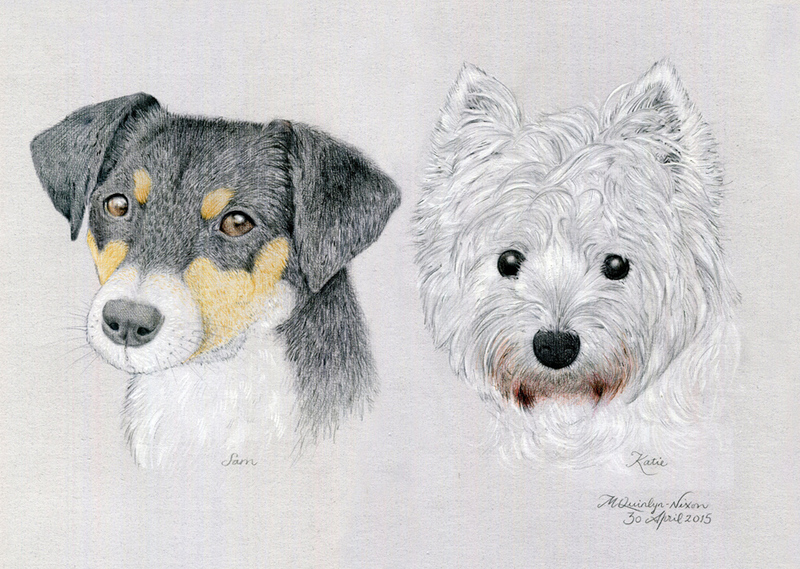 I loved drawing the picture of Katie, who looks just like the kind of canine friend I would love to have had myself. I have always had a ‘soft-spot’ for Westies, to be honest. I chose a silver-grey background paper to draw this illustration on, as white would not have been a good contrast to Katie’s light fur and too dark a colour wouldn’t have shown Sam in the best way either, (as both dogs are rather a tonal contrast). I had to resort to using a wide variety of mediums to produce this illustration: coloured pencil, watercolour paint and even chalk. I don’t often mix mediums, but this seemed to give the right feel for different parts of the picture. I handed over the commission to Graeme on the 14th May (whilst we were having a catch-up and a coffee in Starbucks) with a certain amount of trepidation, as I had never met Sam and Katie and wasn’t sure that I had ‘captured them’ in the illustration. It always gives me a sigh of relief when I know that all of the chalk, sweat and paint have met the hopes and expectations of the person receiving the final piece of artwork. Phew!